This is a waterline 1/350 scale resin kit by Combrig Models. Available as a waterline only. Baku (Russian: "Баку") was a Soviet Red Banner destroyer leader of the Leningrad-class (she was reclassfied as a destroyer in 1949). She was built by Dalzavod in Komsomolsk na Amure. The ship was laid down on January 15, 1935 as Kiev (on December 27, 1939 renamed to Sergo Ordzhonikidze and on September 25, 1940 toBaku), launched on July 25, 1938 and attached to the 1st Division of destroyers of the Pacific Fleet. 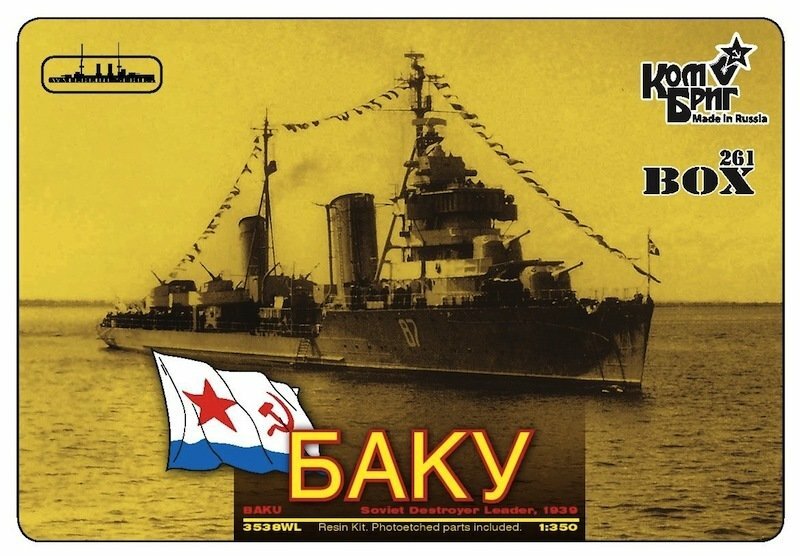 In 1942 Baku was transferred to the Soviet Northern Fleet via the Arctic Ocean. During World War II Baku travelled over 42,000 miles. On March 6, 1945 her crew was awarded the Order of the Red Banner.